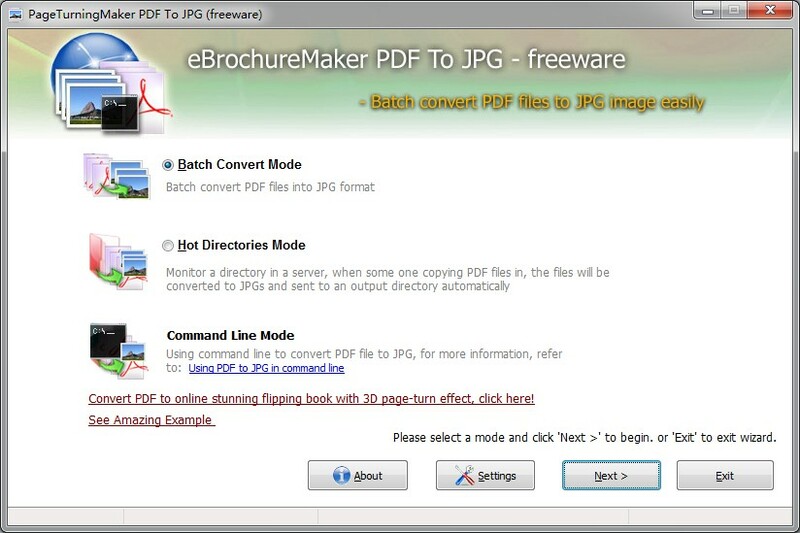 PageTurningMaker PDF to JPG Freeware - Free convert PDF to JPG! Outstanding PDF to JPG converter to quickly batch convert PDF to JPEG file in high definition! Want to convert PDF to JPG, but can't afford the high expense of those PDF to JPG converter? Also worry about the image quality of generated JPG documents? Now, PageTurningMaker PDF to JPG Freeware will provides you best solution and satisfies all your need. PageTurningMaker PDF to JPG Freeware is powerful Windows application that quickly batch convert any PDF to image in JPG format. Users are able to customize DPI and Page Range in conversion setting. Want to convert PDF document to wonderful page turning book, please refer to Page Turning for PDF. Compatibility - Software is written for Microsoft Windows OS, it is compatible with Windows 98 or above. And software supports PDF in Adobe Acrobat version 5 or above. Three Conversion Modes - PageTurningMaker PDF to JPG Freeware provides three conversion modes selectable for user to choose from. Batch Mode: Batch turn numerous PDF documents into JPG at the same time. Hot Directory Mode: A convenient mode to help convert PDF files silently and automatically. Command Line Mode: Use command line to convert PDF to JPEG. High Definition - Software enable user to customize DPI so as to produce JPG files in high definition. High Efficiency - Software has no limit on PDF file size and PDF pages, and it is of capacity to convert hundreds of PDFs at a time with great efficiency. Custom Settings - Users are enable to customize certain page range for conversion, and define the picture quality of output JPG. Even define output name patterns with macro parameters. Completely free - PageTurningMaker PDF to JPG Freeware is delivered as free version, which can be downloaded and used without anything charged. Our core product, Page Turning for PDF Maker, is page turning book software for converting static PDF into dynamic flash flipping book classically. It can be used for all users to create flash e-books, e-Magazines, e-Brochures, e-Catalogs, etc. All features on design-setting interface can be used easily. Free Download, Make a try! Page Turning for PDF is a brilliant piece of software I am so pleased I got it. Just wanted to tell you how great your product is! !